to the escape hatch! : Favorite Scene Friday! The Usual Suspects: A Perfect Ending? Favorite Scene Friday! The Usual Suspects: A Perfect Ending? How many films have perfect endings? It has to be a pretty small number. Sure, countless movies have great endings. A lot wrap up nicely and leave you feeling satisfied. But how many films have truly perfect endings? Down to the last second? Ending aside, The Usual Suspects is an excellent film. 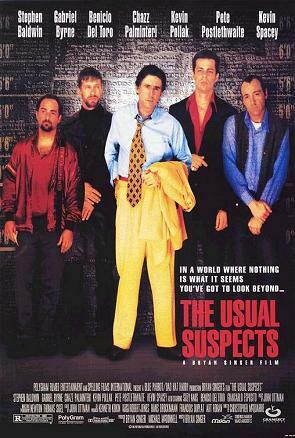 Directed by Bryan Singer and released in 1995, the film tells the story of a group of “Usual Suspects” who are all recruited by a mysterious man named Keyser Söze to pull off a series of robberies. Most of the film is told in flashback form by Verbal Kint (Kevin Spacey) one of the only surviving Suspects. You see, the group's last job went bad and most of Kint's teammates wound up dead. U.S. Customs Agent Dave Kujan (Chazz Palminteri) spends the whole movie questioning Kint in an attempt to find out what happened. So what do you think? Perfect? Or just really, really cool? Let me know, and, while you're at it, tell me some of your other favorite endings. And have a great weekend! Great movie and yes I agree, one of the best endings of all time. I don't wanna compare but Happy Endings did a parody episode that was pretty funny. Great scene! I need to watch Happy Endings. What I have seen has always been funny. And they did a Usual Suspects episode? Gotta check it out. Really amazing ending! I have not really gone back to rewatch the movie specifically with that in mind so that I don't over think the movie in case I don't enjoy it as much. I also love how they parody it at the end of the first Scary Movie. It was such an unexpected reference. Jess - I actually wanted to go back and rewatch the movie before posting this scene but I couldn't help myself. It's been about 2 or 3 years since I've seen it and that's far too long. I haven't seen Scary Movie in a long time so I don't really recall that scene. It's funny that it has at least two parodies and I haven't seen either. Thanks for commenting! Yep, one of the all time great endings. This flick really floored me the first, I dunno, 10 times I saw it. Love it. Alex - That's a great way to describe it - it totally floors you. I really want to go back and rewatch it. I don't think it will ever get old. As always, thanks for reading!